For the last month (on and off) I’ve been working on drawing an almost life-sized self-portrait using charcoal on a huge roll of hot press watercolor paper that my mom sent to me. Mainly, this was a kind of technical assignment for me. 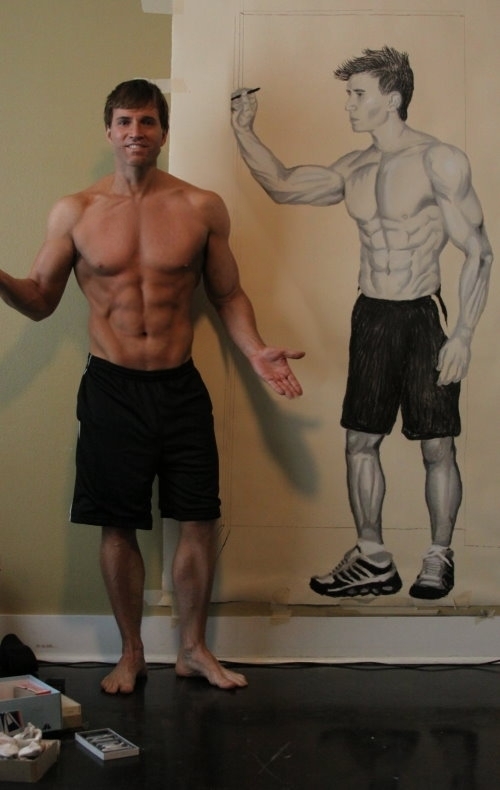 How do I draw a self-portrait that is almost life-sized? How is working with charcoal on a very large scale different from working with charcoal on a smaller piece? How do I deal with the tons of charcoal dust that I have to inhale when I’m working on something this big? And so on. So what have I learned from this exercise? First of all, working on a large scale takes a really long time. Although I obviously worked only off-and-on, I began this project over a month ago. Even now, you can tell that the background is fairly minimal and I could have kept going and adding detail if I wanted. However, I’ve become a little bit disenchanted with the project so I’ve decided to call it quits with this, and perhaps re-charge some energy to do another over-sized charcoal project in 2012. I also learned that it’s very messy. I’m sure that when Jon sees what happened to the baseboard of that wall that you see the edge of in the photo above, he will kill me. There is no way that charcoal dust is ever coming off completely. Next time: put down some kind of mat or plastic or cloth or something. But, on the up side, this project was fun while it lasted. I can tell that some of my proportions are off, which is partially a function of me simply learning how to draw using strokes-of-my-arm instead of strokes-of-my-hand (because of the size). Also it’s just partially because I’m still learning as an artist, anyway, so I simply don’t always get proportions correct. One thing that I discovered that really helped was that I could go through several iterations of putting down rough areas of different tones (whites, grays, blacks), and then use the blending stump to smooth and paint and blend the areas into contours and smooth lines. Then, I would spray the whole thing with a fixative, and go back and do it again in areas that needed it. Being able to “work over” existing work helped a lot, which you can see somewhat by looking at the photos of the previous stages. Anyway, I’m probably done with messy charcoal for a while. The tablet is so much easier, or maybe I will go back to pencil sketches for a bit. But I still have a big roll of the large charcoal paper left. What should my next big project be, when my energy and enthusiasm for charcoal has been restored? Maybe some kind of science fiction monster or scene? This is awesome!!! So talented!